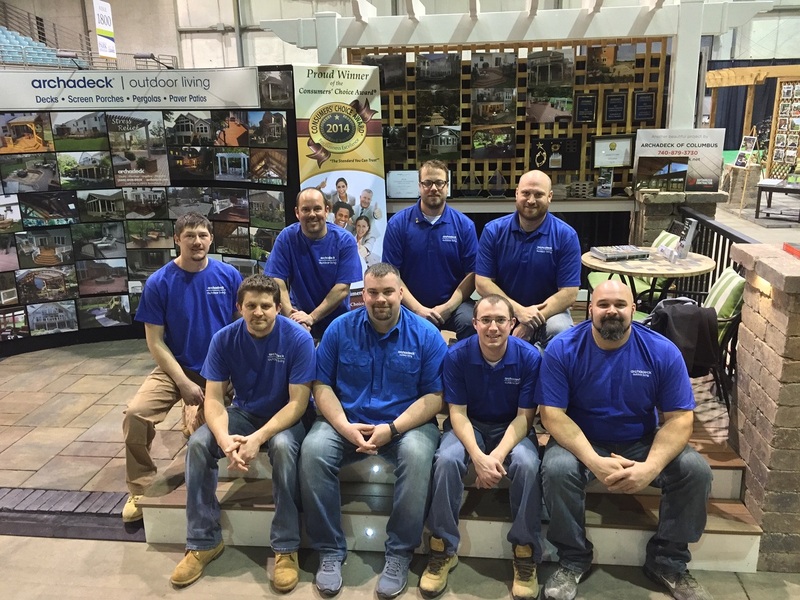 Archadeck of Columbus delivers the service and community commitment of a local, family-owned business backed by the strength of a company that’s built 100,000 incredible outdoor structures since 1980. We offer you the benefit of an international architectural design center that will custom design your project to complement your home, suit your personal tastes and meet your exact needs for functionality. I began my association with Archadeck in 2001 when I was working for a subcontractor that Archadeck of Columbus was employing for patio installations. I had been working in the Landscape/Hardscape industry for quite a few years at the time and immediately noticed a difference in how Archadeck operated in comparison with other deck companies that we worked with. Over the years of working with Archadeck on numerous projects, large and small, I came to realize the importance of what they were selling; beautiful designs, top-notch craftsmanship and a world class customer experience. This is what drove me to start working for Archadeck in January of 2011 and eventually buying the company in 2016. My wife, Amber, and my son, Logan, could not be happier to be a part of such a wonderful organization. We look forward to the future as we build the outdoor living environments our customers dream of with the world class service they deserve! At Archadeck of Columbus, we take service very seriously. We’ve been here more than a dozen years. Not only do we want every customer to be delighted but we know our best customers are the ones referred by the ones we’ve already worked with. 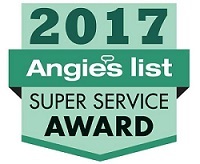 We are very excited to have won the Angie’s List Super Service Award again. Archadeck of Columbus has won this award every year since 2006! 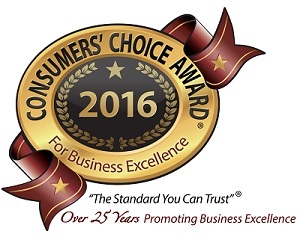 Proud winners of the 2012 – 2016 Consumer’s Choice Award! We invite you to call for a free design consultation (and/or a free deck safety inspection if you happen to own an existing deck). At your consultation we’ll show you past projects, discuss your needs and tastes, explain your construction material options (including the new, low-maintenance wood alternatives), talk about costs, and measure and photograph your home/lot. The design consultation is completely free and you are under no obligation to hire Archadeck. Should you decide to move forward after your free design consultation, we will custom design your building plan. You will still not be under any obligation to hire us as your builder until you approve your plan and sign your contract. Of course, once you do sign that contract, you will be protected by two separate guarantees, constituting the most expansive customer protection plan in the industry. And local oversight assures your property and privacy are respected. We attend to every detail from securing any needed building permits to final cleanup. And we work very hard to be as unobtrusive as possible during the entire construction phase. Thank you for considering Archadeck for your project. We hope to hear from you soon. Interested in a custom deck? See the navigation at the top of this page to enjoy a myriad of photos, special pages devoted to our most popular outdoor spaces and more. Thinking about building a deck? Take a look at our Columbus deck builder page to see a virtual tour of some of our Columbus TimberTech decks. Then move over to our photo gallery of Columbus decks. Click on the decks you like to see larger photos and to read more about those projects. Columbus Paver patios and hardscapes are immensely popular. As their popularity grows, so do the design options, material options, and creative configurations. Then peruse our Columbus hardscape and patio photo gallery for a virtual feast of some of our favorite patio projects. We are also very excited to have been featured on Extreme Home Makeover Home Edition in 2011! Archadeck of Columbus was contacted by the Extreme Home Makeover team to assist the Rhodes family of Columbus OH in rebuilding their house. We built a deck outdoor living area over their detached garage. The TimberTech deck also included a pergola and was furnished with great red and white colors for these homeowners in the home of the Buckeyes. We build custom outdoor living spaces for how you want to live. Many of our clients select combination spaces that include a deck and patio, a screened porch in combination with a deck, or a porch in combination with a patio. Building an outdoor living space is a big project and it makes sense to build not just a square space but a space that will enhance your living enjoyment at your home. Both the hardscape and roof structure crews were superb! They were meticulous in their work and made sure that everything was done right. Rob, and the project supervisor, Phil, were top notch in their knowledge of the project and various construction practices. They were also very polite and courteous. The finished product itself was everything we had hoped for. We now have a beautiful paver patio and roof over it to enjoy for many years to come. We are very happy with it and the experience! The Archadeck team came when they were expected, always being professional and in great spirits. Mike was true on his word on fixing any issues immediately without hesitation! Everyone, and I mean everyone, on their team was polite, helpful and patient. The overall experience was wonderful and I received a wonderful product at the end. Our experience with Mike from Archadeck was different. It was professional from start to finish. He listened to our ideas and provided us with feedback. The Archadeck estimate included detailed architectural drafts of each stage of the deck construction complete with a 3-D computer rendering. The cost was somewhat higher, but Archadeck’s portfolio and our overall impression with Mike and his presentation won us over. We highly recommend Archadeck. I cannot speak highly enough about Archadeck of Columbus and Rob Mitchell. It is very unusual to find any company that takes service, quality, and professionalism as seriouly as I do, but Archadeck is one of them. From beginning to end, everything was above board, honest negotiations, contract followed to the letter, and unparalleled communication. Of our 3 estimates, they were in the middle, which ended up being the best value for the money especially in light of the service, craftsmanship, and quality that followed. It did take about 3 months to schedule our project from the time we signed, but this was explained ahead of time so there were no surprises. Since we weren’t in any particular hurry, it didn’t matter except a 30% deposit is theirs while nothing is happening. However, they ended up starting 2-3 weeks earlier than expected and finished on time and within budget. The demolition of our old deck and foundation preparation was completed in 2 days and a 700 q. ft. patio with firepit and seating wall was completed in a week then a couple of days for placing polysand to the patio, filling beds, and a walkthrough. I could not point to a single problem of significance; and even if there were, the superior communication from beginning to end would have caught it early. The installation crew led by Paco was on-time every day, fast and efficient in their work, and unwavering in their attention to detail and quality. Plus, they were very nice, polite, and arrived and left with smiles and pleasant conversation for myself and family. Rob Mitchell who was the project designer and supervisor was the model of professionalism. His training and experience was evident in every phase of the project. Even after the completion, he encouraged us to call him any time for questions or advice (which I did on a Sunday morning once without concern or complaint). I recommend Archadeck without qualification or reservation for any of your deck, patio, hardscape, landscape needs! They installed a screened porch and deck. They removed the old deck and designed and crafted the new one. They worked with us to make it exactly the way we wanted. Mike was very easy and helpful to work with. He was very professional and helpful in every step. The crew was clean, polite, and very respectful. I would work with them any time. Replaced existing footprint of cedar deck with Timbertech composite materials. Work also consisted of replacing screens for the screened in porch, and a replacement wood door off of the porch. Mike’s approach from the start was very professional – we were looking for people in the decking business, running it as a business, which is certainly the case with Archdeck. Mike listened to our needs, didn’t try an sell us anything we didn’t need or want. The deck installation itself was great – the installation team was on time, worked efficiently, and demonstrated an attention to detail we didn’t expect to see. This aspect more than met our expectations. We did have one part of the process that elongated the final completion – negotiation over the door, that was custom ordered, but ended up not being the door we thought we ordered. If anything, this was a minor miscommunication. Mike and his team throughout the process were tenacious in their followup, phone calls, e-mails, and very professional. Archadeck completely designed and replaced my deck. This included removing the old deck and deck under structure and regrading the area. They were also willing to use a new (for them) system to attach the deck boards which did not put drill holes through the top of the deck boards. The project was made more difficult because of the location of the deck and the problems of accessing it. Archadeck did a great job of removing the old deck with minimal disruption of landscaping. They built a bridge over a small stream to avoid damaging landscaping around house. They were willing to try a new attachment system for the deck boards which avoids putting any drill holes in the surface of the deck boards. They recommended and installed a number of additional things around the deck such as down spouts to prevent future damage to the deck (something the previous deck installers did not recommend or do). They coordinated well with the hot tub company for the timely installation of the hot tub. Overall the quality of the work is excellent and we are very satisfied with the finished deck. We replaced wood decking with Timbertech on 5 deck areas and a screened porch. Mike helped re-design the decks off the porch and replaced wood decking on others. They did a great job, although starting date got delayed some due to previous jobs and weather, once they started the work progressed smoothly and efficiently and they were done in the approximate time estimated. Workers were polite and hard working, cleaned up every day and worked with me on minor details. I got phone calls with updates or delays and was contacted whenever something unforeseen came up with the project. Michael came out for a final inspection and we walked through the project together, coming up with a few finishing touches that will enhance the overall great job. It was a tremendous experience. Mike was very professional and explained everything that Archadeck does in great detail. He was conscious of our cost concerns and designed a deck that fit what we wanted and was within budget. Seth built the deck and was always on time (or early), did his work quickly and professionally and precisely! The work area was always clean and organized. Seth was also willing to answer any questions that we had and encouraged us to ask more! It was a tremendous experience. We are extremely happy with the deck and recommend Mike, Seth, and Archadeck to anyone. Mike Reeder and his staff designed and built a replacement deck, complete with gazebo. Project involved a total change in design and complete removal of the old deck. Removal and preparation required use of a small Bobcat. For this, they used a plywood path and platform to minimize disturbance to the lawn. The overall project commenced and completed on schedule; there were no delays, surprises, or disappointments. Seth worked efficiently and with precision. The gazebo was an adjunct to the deck, and Mike had coordinated closely with the provider on details and schedule. Mike was readily available during construction, and conducted a thorough inspection with us at the completion. Site clean-up was prompt and thorough. I have procrastinated a year in providing this report (project completed in April 2007), but there are no negatives to tell. The experience was positive from the very beginning. For us, Mike offered the right combination of expertise, audience and advocacy. He knows his product and explains it well. He listened closely to our ideas and concerns. He offered suggestions and advice, when appropriate. He told us what would not work, and why. He took great pains to develop several proposals for our consideration, and then patiently answered our questions throughout the winnowing process. The preferred option went through three revisions before becoming final. Comments regarding construction are noted above, but this account would not be complete without noting the many favorable comments that we have received from visiting friends and relatives in the past year. As a result of all this, we would definitely recommend Mike Reeder and Archadeck to others who are considering a deck or similar project. We had a great experience overall. Our deck turned out amazing. Mike and his staff did a great job walking us through the process and Andy was very meticulous. Treated our project like he was doing it for his own home. Great communication as to what we should expect and when. We contacted this company to replace our wooden deck with composite material decking. Our call was returned quickly and Michael arrived promptly for our initial meeting. Detailed information was provided regarding materials, warranties color choices. An estimate was provided during the initial meeting. The job was completed on time with a wonderful crew of workers. The crew leader was accessible and kept in contact with us daily. Archadeck helped us redesign and replace our 20 year old deck. They worked with the city to obtain the necessary permits, and made sure all work was to code. They introduced us to materials that other deck companies did not expose us to… and we used these materials and LOVE them. Our deck surface was removed, the original frame was still good and able to be used. Archadeck then resurfaced our deck using timbertech, cedar, and aluminum pickets. The result is fantastic. We have received many compliments and would recommend them to everyone. From the beginning, the presentation and professionalism of Michael and his team set them apart from the other contractors. We were never disappointed the entire time. If something was not quite right, they were quick to fix it or change it. As promised the carpenters cleaned up every day, never had music blasting, and were always VERY polite and professional. They seem to be a bit more expensive than the other quotes we received, but they completed the job very quickly, and were worth it! We would use them again any time! Archadeck built a small deck and a pergola. The work quality is outstanding. The deck has the look of fine furniture in it’s overall finish. The pergola was laid out so well, that the assembled pieces into place with no prying or shimming or other adjustments. Our deck was caving in and was a hazard. We needed it demolished, redesigned, and rebuilt. Wonderful Experience! Mike(the owner)came out and took pictures and measurements. He then created computer generated 3D graphics of what our new deck would look like on our house. The graphics showed our house, what the deck would look like from the back windows, from the road, from every possible angle. It was amazing. We knew exactly what we were getting before construction began. The employees were wonderful and very attentive to what we were looking for in a new deck. The work was done as stated. The workmen were great! They finished the job as stated and worked with my having dogs on the site. It was very expensive but the finish product was well worth it! I would refer this company to another that needed such services. I had my old deck torn down and a new one built. I also had a 8 person hot tub installed on the deck and privacy fence built around it. They were referred to me by a friend of mine who spoke very highly of them. Mike came out and explained their process and worked with me on what I really wanted in a deck. Once we agreed on the ideas I wanted, they created a really neat 3-D colored design of the deck against my house, they had a couple of options for me to pick from. In general, they were always on time, very responsive, and willing to fix things that I didn’t think came out as I thought it would (my fault). The most important thing to me was that I told them what I wanted and they got the permit, coordinated with other contractors, essentially (and thankfully) leaving me out of the loop, unless I asked for an update. The deck has been a great investment, and thankfully the process was very easy thanks to Mike and Carol. Archadeck replaced our deteriorating wooden deck using the existing foundation supports. Everything went very smoothly from the original estimate to the finished product. The young man who built the deck was punctual, friendly, and very neat. The job took approximately 3 days, and each evening he took away any trash leftover and removed all of his tools and work benches. He took time to address any questions we had during the process. The finished deck looks great, and we have had many compliments so far! Very professional presentation. 3-D imaging puts everyone on the same page in how the final product will look. Installation date was moved up two weeks which coincided with our vacation. Mike or Carol called everyday to give us an update. Amazing customer service. Work was completed as proposed in rendering. Archadeck Of Columbus installed a beautiful porch. They really had a great employee working for them who did most of the work. We had a great storm and there was no power. He let me plug in my refrigerator to his generator. He had to bring his own generator to do his job. He was a very nice guy. He also took some of my frozen food and put them in his refrigerator. My neighbors also appreciated the porch. We had a really good quality work done. We had got 3 quotes and there was another guy who was the same price. There was another guy who was very expensive. Their price was average. I would use them again in future if need be. Archadeck turned my drawings into a professionally-designed two-tier composite deck/paver patio masterpiece. From the beginning, you could tell Mike Reeder brought a tremendous amount of credibility and professionalism to the project as we turned my design into professional drawings. Mike worked with me to tailor the look and feel I wanted into specs that worked functionally and within my budget. The work got started on time and the carpentry was outstanding. It was clear Josh and John cared as much about the quality of the product as I did. I have an eye for detail and high standards for the quality of the work, but when Mike came out to inspect the near-final, and then final product, he pointed out – and had corrected – several imperfections I wouldn’t have even noticed. Great experience all-around from the Archadeck team. Don’t bid out a project without talking to Mike. From the day we met Michael Reeder and reviewed the work Archadeck of Columbus had completted for other Central Ohio families, we knew no one else could match the quality of design or workmanship. Our neighbors wish they had Archadeck do their deck after seeing the quality and custom crafted workmanship. We highly recommend Archadeck. Michael’s design book was full of great ideas and his attention to detail including permits and inspections left us with little to do but watch the magic happen. We have a new and exciting outside room to entertain and relax on for years to come. Michael and his team were professional, courteous, and a pleasure to work with. Customer service is one of their main priorities. We found Michael extremely easy to work with as he strives to give the customer what they want, even when they don’t know themselves! The design of our deck has really enhanced our home, visually, and has appreciated the value considerably. It has transformed our backyard into a very unique area that we now love and use. Archadeck was very professional, and their work was excellent. The final result was beautiful, and a definite enhancement to our home! Everything about our experience with Archadeck was good. They were extremely professional, pleasant to deal with and did everything they said they would. The quality of the construction was excellent and is backed by Archadeck’s national warranty. Michael Reeder was great to work with from the design stage to completion. He is full of great ideas, and truly appreciates your business. The deck that Archadeck built for us was exceptional! The craftsmanship was outstanding. The lead carpenter, Josh, was very courteous and helpful. I was happy with the entire process, from design consultation to finished product. Employees were professional, polite and courteous and I love my new deck! The quality of the workmanship is second to none. I know that we will be enjoying our deck for many, many years to come! I have already recommended Archadeck to my friends. Rob and his team are hardworking and always provide honest and helpful information. They are masters of their trade. Don’t hesitate to call Archadeck of Columbus for your outdoor living project! The quality of Archadeck’s craftsmanship is top-notch! I had met and discussed what I wanted to do with other companies but no one impressed me more than Archadeck. Their prices are fair, however their quality is the best. Their team members constructing the decks are clean, respectful, and fast! I would highly HIGHLY recommend them. Rob Mitchell and his team at Archadeck are second to none. We were very pleased from start to finish. Everyone was professional, the work is high quality and the project was completed quickly! They will do whatever it takes to make your ideas become a reality. We are already planning some additions. I highly recommend using them for your next project!.